I don't have MS, it has me! | Progressive MS–the pits! Heck! Don’t laugh…I could not find the darn LOGIN page here! I got to it finally in a roundabout way. Next option: spend a ton more money on a custom built chair. I hate this. I should have moved to Japan. I think things would fit me there. The edema got to be a very serious problem.I developed venous stasis ulcers. Ick. I had to go to a hospital to get treatment, because my regular doctor was freaked out by it and sent me there. It turned out I was right-it WAS venous stasis ulcers. They are healing now but I have to wrap my legs everyday with ace bandages to keep the swelling down. For the rest of my life. Oh well. It’s not like I was planning to hit the beach or something anyway..
Man, this blog is depressing. I guess it’s okay.Nobody is reading it. Now, mine won’t be leather, but it’s the same style. It’s electric and has heat and massage. It lifts up like you see in the photo to assist me getting out of the chair. It also reclines and can lift the legs higher than the heart, which will help me get rid of some of the edema in my feet and legs, which has become a serious problem for me. Best of all, the massage motors are ALSO in the lower leg area, which will further assist the fluids in my legs to drain back u into my body where it belongs.Is that great or WHAT? I ordered it a few weeks ago and am waiting, waiting..it had to be custom built as I am petite and need controls on the left side. I can’t WAIT for this chair to get here!!!!! 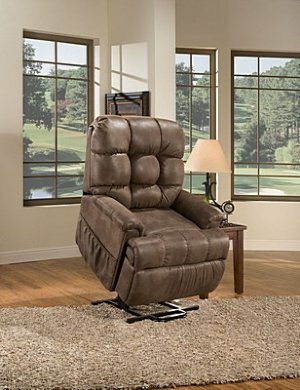 I am so excited at the prospect of a chair that will help me instead of hurt me. It will make me more comfortable and not less. It will help relieve some of the pain in my feet too, I think. I also got a hospital bed for myself because it is impossible for me to get out of my present bed by myself. The hospital bed should electrically lift up and down from the floor(the whole bed, not just parts) and that will help a lot. These things were expensive, but I have no insurance and had no choice. I need them now.I put off buying them as long as I could. Man….this blog is really boring, isn’t it? I don’t know what to do..I feel that I ought to make this..for anybody who is unfortunate enough to be following in my footsteps and wants to know what others do about this or that. So I am doing this but it feels strange and empty somehow. Well, I will continue anyway. That includes the state of being “ridiculously healthy”. My doctor used to pronounce me a “ridiculously healthy lady” after my check-ups, before I got sick. I really wish she would tell me that again. I knew at the time that I was lucky. But if someone had told me that in a few years I would be stuck in a wheelchair, I would have tried to cram in a lot more living back then. By the way, the photo is Nargis Dutt. She is gone, it was cancer, about 30 years ago.